I was stunned by the subject and depth of this novel. Ms. Picoult does not shy away from the hard, cold facts and reality of abortion and she includes so much humanity and love in each character - from the clinic owner to the physician to the clients there for various reasons. Cleverly crafted, clearly researched, thought-provoking, real, raw, page turner ... wow. My source: Daughter-in-law-to-be Hillary is a huge Jodi Picoult fan. I got to read her signed copy. She told me Ms. Picoult designed the book to be read in either direction - front to back as bound, or back to front of book. Amazing. My verdict: Couldn't put this down. Highly recommend. 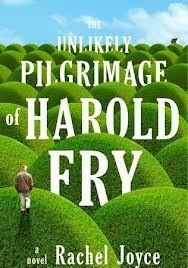 "The Unlikely Pilgrimage of Harold Fry"
my take: In this delightful tale, Harold is newly retired and bored, anxious, and quite sure he's missed out on something important in his life, as in forgotten or failed a task. One morning he sets out down the road, similar to a Forest Gump run across the country, and begins a trek to find the woman he thinks he has slighted, who may be the missed opportunity to be kind, or do something meaningful. Along the way he ruins his feet, picks up a following, and completes the ultimate hero's journey ... the interior odyssey of self-knowledge. Ms. Joyce shows how 'things' become much other than the 'thing' and take on a life of their own, especially in life in the social media and 24/7 news cycle era. Gosh, my feet ached in solidarity with Harold's. my source: HA! can't remember. If you're the person who suggested I read this five years ago or so, thanks! 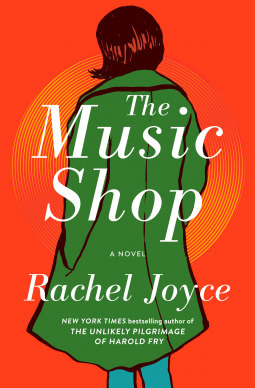 my take: On a run-down street in 1980's London, wander into a shop full of boxes of records and a guy who can intuit the need of a customer. Step into his listening booth - an old wardrobe fitted with a chair and headphones, reminiscent of stepping into the furniture that leads to Narnia - and hear the soul restoring sounds. Look around and see a cast of down-on-their-luck shop keepers trying to eek out a living. Catch a glimpse of the mystery lady in the green coat. This music shop stocks only vinyl. It's an exploration of the staying power of some art forms and the push for technology to be smaller, faster, easier. It's an exploration in the staying power of community - if we stand together we make it; when we are divided we crumble. I wish I'd seen during the reading experience the link for the Spotify playlist - find it whilst you read and enjoy the various prescribed songs. My favorite scene involves the "Hallelujah Chorus." my verdict: Good feel good read ... some might say a beach read AND the kind of thing you might need in a dreary season. Not as great as The Unlikely Pilgrimage of Harold Fry or The Love Song of Queen Hennessy ... AND still worth a read. 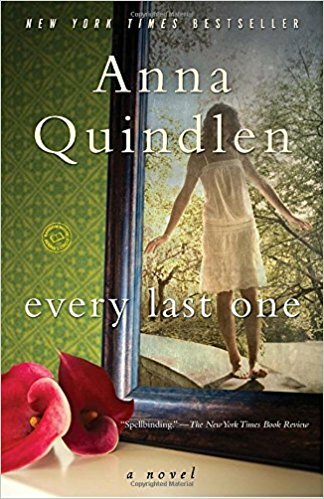 my take: Much in the style of Olive Kitteridge, each chapter is an intimate look at a related character. And, oh! the things they reveal. People are so interesting. This is a little like people watching on a park bench or in a coffee shop. Each story has a little something to do with another character, many of them referencing Lucy Barton, the small town, poverty stricken girl who's made it big by publishing a book. Many of the stories tell of their perceived or actual treatment of inferiority or superiority over another. The thread through many of the chapters that stands out are the corn and soybean fields. For several characters they are the home sight and sound, the grounding, the center, the returning to childhood. I wonder if it's how the smell, sight, sound of the wooded Lake Michigan shore are home and center for me. It makes me wonder if everybody has a heart place. Elizabeth Strout is a favorite and she does not disappoint AGAIN. This isn't so much plot driven as inner reflections, memories, pivotal/seminal moments. This book MASTERFULLY dovetails/informs My Name is Lucy Barton. Please read both. I re-read Lucy after finishing Anything. my source: Costco find in hardcover. Then left it at a cottage for a year ... happy to be re-united. my verdict: Five stars. So is My Name is Lucy Barton and Olive Kitteridge. A three for one review. You're welcome. 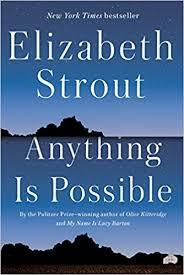 Actually, read anything and everything by Elizabeth Strout. 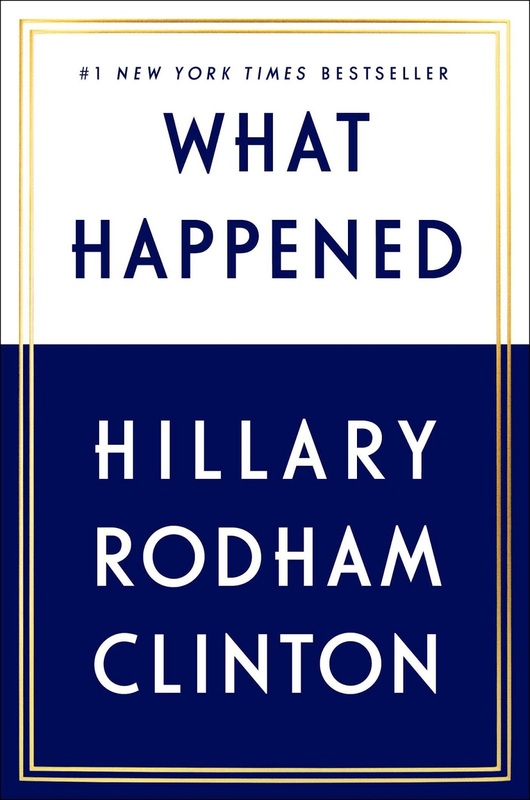 my take: With humor and lots of articulate sentences, Hillary Clinton describes her experience of running in and losing the 2016 election. And does she have words! And is she meticulous! It's a big book. The chapter on the fake news, trolling and bots is especially interesting. She tells of her relationship with Putin and how she was preparing to deal with the fallout of the meddling and future encounters. As a former Secretary of State she has a command of not only the facts, the players, and the magnitude of the problem, she has skills for leading the country through the mess. If only. She takes responsibility for what mistakes she made and lays out a convincing argument for the part Russia, James Comey, the circus mentality of the media, and other factors played in the election outcome (including Bernie supporters) ... and THOSE DAMN EMAILS (chapter title). As a society, we're much more comfortable with men talking of their prowess and conquests. 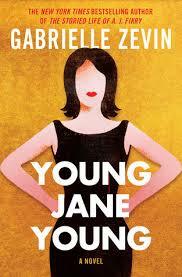 If you are not used to a woman confidently sharing her strengths and accomplishments, this book will feel foreign, odd. Likely there are groups of people who crucified her for bragging. The chapter on election night was poignant and hard to read because it brought back that night so clearly for me. I shall never forget where I was, with whom I shared the evening, even what I wore. Her final chapters called "Love and Kindness" and "Onward Together" are fantastic. I give her credit for the optimism and kindness she shows throughout the book. A private person by nature, she opens a few windows to see into her world for the last few years. I, for one, wish things had happened differently, wish her well, and am eager to see how her Onward Together movement grows.